China’s market volume ishuge, but for foreign companies, getting into China has always been a problem.No localized features to fit Chinese market, or solving problems the same wayas local companies, have all been proved to be deadly. 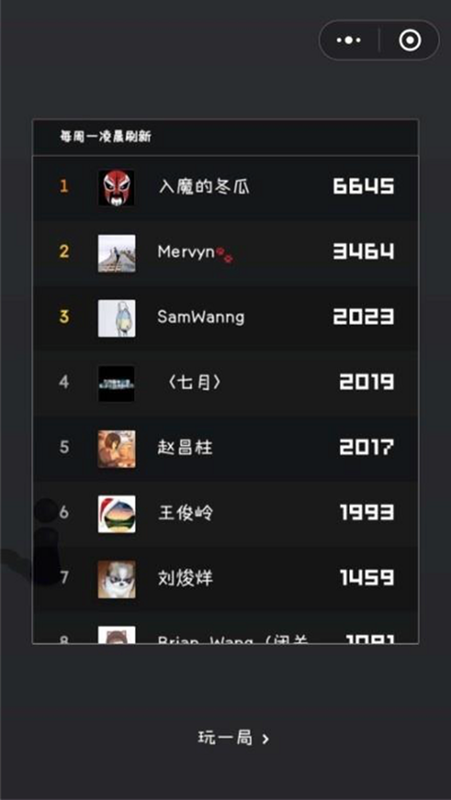 This research covers Chinatop marketing platforms, agencies, creative campaigns in the past year, as wellas 4 main marketing entries within WeChat, and marketing trends in 2018.Supported by a lot of research, reports, and my personal experience with thosecampaigns and things I noticed from the people around me, finally I’m able toput them together and share with you. I use platforms, becauseTencent is so much more than just WeChat, even though at the end of 2017,Wechat has already covered 94% of Chinese smartphone users. It’s super weird tosay, “sorry I don’t have a WeChat”. What make them the biggestmarketing platform, is that in the past 3 years, they has successfully built amarketing ecosystem, which means they have connected different platform withinthe ecosystem. What’s more, they are morethan these entries. 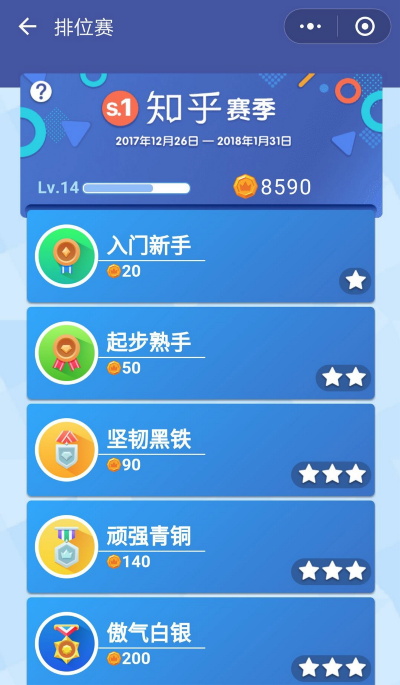 Mini program within WeChat is getting more and more popularwith some games and tools applications. Everyone can simply see the potentialof ads and marketing strategies in them. 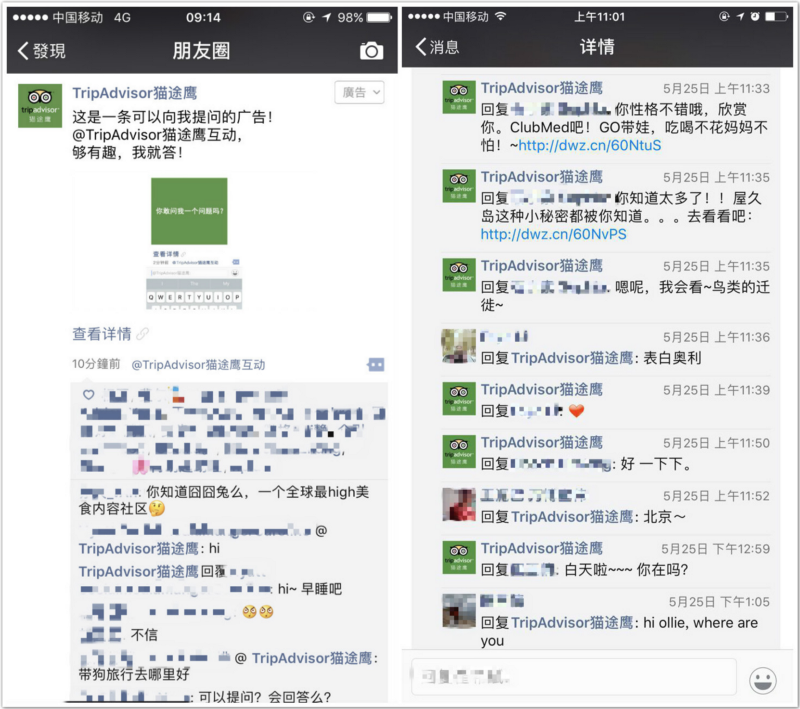 Meanwhile, WeChat Moments (=facebookfriends feeds) has also open the API to post, manage and collect data from theads or videos they post in particular group of people. They selected themid/high-end smartphone young users in big cities, as well as who speaksEnglish, or has studied abroad. People can like the ads, they can also see thelikes and comments their friends have posted, which make them also want to be“existed ” at least. Alimama is the big datamarketing platform of Alibaba. They have over 500 million data and traffic ondaily basis, covering 98% of Chinese Internet users through PC, mobile andSmart TV. They just announced they had reached 1 million accounts goal. Last year, has created a setof tools that aggregates and analyzes that data so brands can better identify,target, reach and retain their customers. Alibaba calls it “Uni Marketing,”based on the unified IDs that make this customized tracking possible. OPPO R11 has a very clearmarket target, specifically millennials and young people (20–29) from second orthird tier cities. With the help from Alimama, on the release day, in 40 mins,the product exceeded the sales number over their last product of an entire day.And within 1 hour online, they jumped to the first place of sales volume andamount. 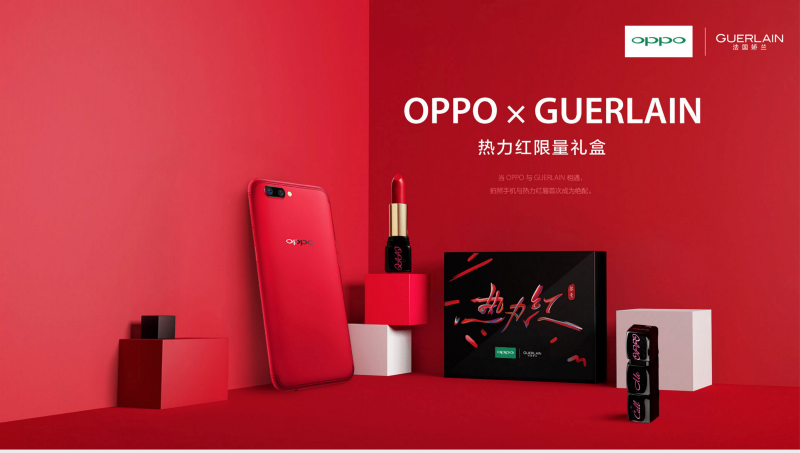 In Q3 and Q4 of 2017, OPPO holds the first place of Chinese cellphonemarket share. During the campaign, theyhave one 800 million product exposure, 80% new users covered, 300 thousand newfans and 120% traffic leverage. 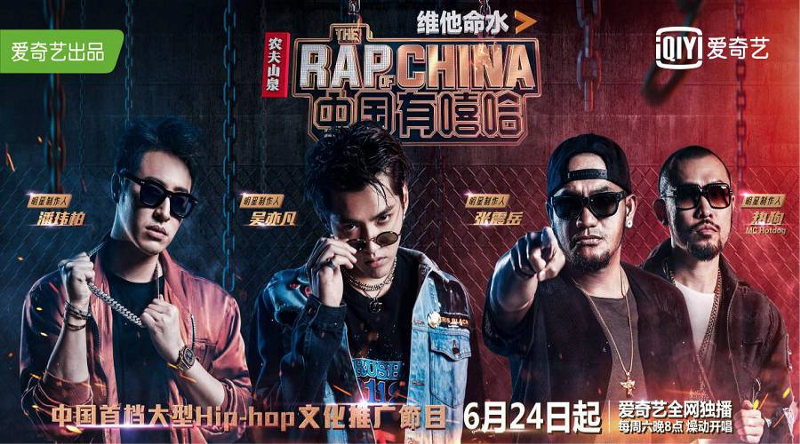 In the summer of 2017, thereare a big wave of Hip-Hop, and the Internet TV show is called The Rap of China,made by iQIYI. They are one of the largest online video platform in China, withnearly 6 billion hours spent on its service each month, and over 500 millionmonthly active users. Besides the show, they alsolaunched the iQIYI public platform, where the content creators can easily getaccess to user image, traffic data and multi-platform ads income. They alsolaunched “Bai i Program” with Baidu. With AI technology and data analysispowered by Baidu, they have much improvement on distributing content. As the exclusive sponsor ofthe show, NongFu Spring wins in any aspects. They have 80 or even 100 marks onsponsors engagement while the industry average is around 50.6; they also knockdown the brands income at 110, while the average is 91.3. Developed and made byBeijing ByteDance Technology, Toutiao used to be a news and information contentplatform, now have opened up several product lines focusing on differentaudience and content forms. 抖音 Douyin for fashion, dance andentertainment, targets on only young people. 西瓜视频 Xigua Videos for second/third tiercities’ users, recently also started live trivia. 火山小视频 Huoshan Videos for second/third tiercities’ users, mostly live streaming and videos. More and more ads are placedin the video feeds, as well as edited in the videos. 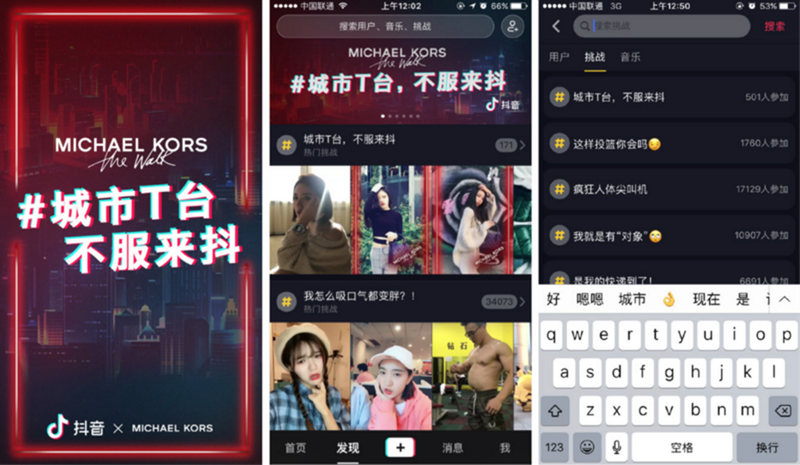 Fashion brand Michael Korspartnered with Douyin, which also targets at young people who love fashion.They kicked off the campaign with some KOL on Douyin, which attracts more than5 million views in a very short period of time, following the customizedstickers encouraging other users to create and share, as well as online/offlineevents. Weibo is a Chinesemicroblogging platform, and one of the most popular social media sites inChina. According to Weibo’s official data, by 2017 Q3, they have 37.6 millionactive users, and 16.5 million active users daily, with 173 million Yuan (25.5million USD) total revenue, and 59.2 million Yuan (8.7 million USD) totalprofits. More than 80% are under 30 years old. In 2017, they mainly focuson 3 things: videos,vertical industry and MCN (Multi-Channel-Network). 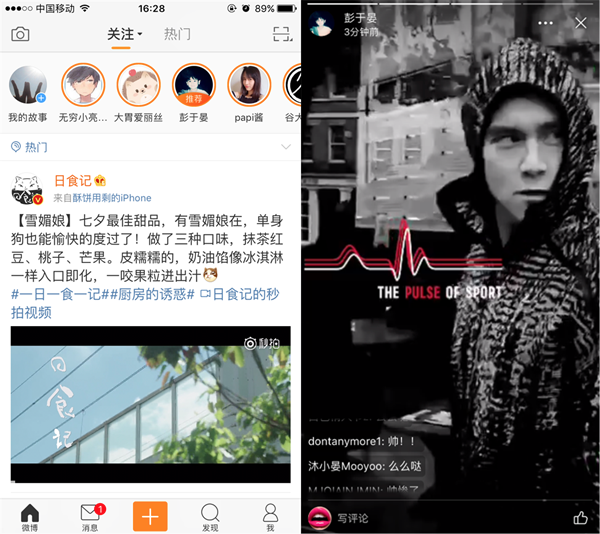 For videos, they launchedWeibo Stories (Instagram Stories, Snapchat) and Guangyin Xiu (easy quick videoediting), encouraging users to create and share their content. For vertical industry, theytried even harder to build every special group and content of each industry,and monetized them. For MCN, they helped MCNcreate a better vertical content ecosystem, expanding weibo content andpurchasing service. Until Nov, 2017, they have embedded 1,200 differentorganizations in 53 vertical areas. MCN may be different fromthe west. What they do here, is to help KOLs create content continuously, andmonetize faster. There is no Adidas’s logo inthe 4 series stories. Peng, one of the hottest actor in China, kicked off THEPULSE OF SPORT campaign on his weibo stories debut in Sep. After the campaign,the active users on stories jumped to 40 million, 200% compared with Q2. Zhihu is a Q&A platform(similar to Quora), and has already reached 17 million users in 2015 with 250million monthly page views. In 2017, they make a lot of efforts to monetize theplatform, not only for them, but users on Zhihu. They launched Brand Q&Aand Brand Live, which are certified by Zhihu. You can pay to ask, or pay tothank them. As for live events, after you pay and enter the live room, you canlisten or watch (based on different forms or content), and ask questions in thechat, it’s like a Twitch for knowledge sharing. And you can always go back towatch again and take notes. Friso is a infant formula(milk powder) company. In China, parents have already lost hope for local milkcompanies due to some accidents happened years ago, so most of them purchasemilk overseas for their children. 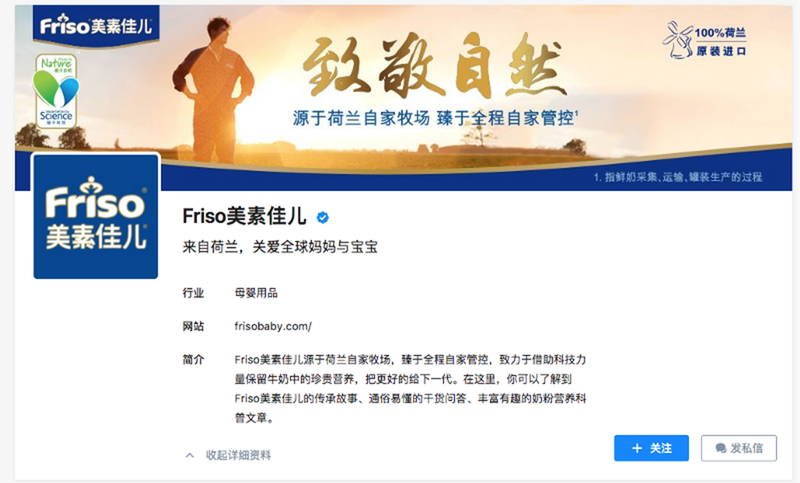 Friso collaborated with Zhihu, opened anofficial account. Besides answering infant milk related questions or bloggingon daily basis, they also started a live event, teaching parents how to selectthe right milk for the children, and it’s free. Most parents who listenedtheir events ended up buying their milk. And because they really pay attentionto customers feedback and reviews online, they have created a really positiveimage on Zhihu, which is essential for a company like them. When parents don’tknow what milk they should buy for their kids, they ask their friends, or theygo to Zhihu and search for recommendations. And if they are on Zhihu, chancesof their buying Friso milk is pretty decent. This works for other brandsand products as well. Last but not least, I haveto mention WeChat. Since they have more than 100 million active users monthlynow, there’re too many opportunities within the app itself, as well as some newfeatures people can play around with. In late 2016, they launchedMini Programs, which provide a new platform for e-commerce companies or evenKOL’s own online shop. During 2017, every month there’re some features releasedby WeChat team, encouraging more programs to submit, and more people to usethem. Now Mini Programs haveenough capabilities to host great content and service, articles, photos,videos, live streaming, shopping, tools, order taxi or share bikes, and nowgames. The key 2 features that separate Mini Programs with other web apps ornative apps, are first its social attribute. You can only share Mini Programswith your friends or groups within WeChat conversations, you cannot even postin the feeds; second, development made easy. Building an app may take you 2–3weeks, but with Mini Programs, you only need 5 days. Early 2018, there’s a gamecalled “Jump Jump” attaining 100 million users in just 11 days after thelaunch. 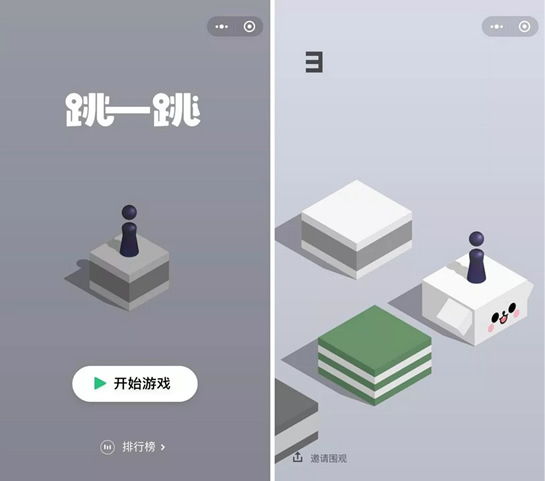 Developed and published by WeChat itself, this game was born to be abig hit. The rule of game is really simple, press the screen to jump to the nextbox, the longer you hold on screen, the longer you will jump. Some specialboxes have extra points, if you are patient enough to wait until it plays musicor sounds. In the near future, the gamecould turn into a “money machine”. Every box could be an independentadvertisement, and if people are patient enough to wait to listen or watch whatthis box offers, you gain extra points or even a “red pocket” (money given as agift). During Chinese New Year of2018, which is coming in mid Feb, I’m pretty confident they are definitelygoing to make something around boxes and red pocket. With the idea of HQ Trivia,a lot of Chinese companies are trying to copy and make their own apps. But somemade their smart steps of developing it in Mini Programs, with the socialattribute as well as short development period, they create more ways of playingand competing. And people love competing for money, and competing for a betterlevel during their friends.